This is latest device with fully Solid Microprocessor Controlled unit, with digital time & intensity display and is portable. 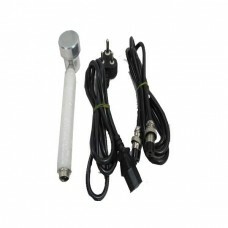 The sound head with a special transducer is designed to keep a very good skin contact for deep ultrasound therapy. The ultrasonic waves differ from other electromagnetic adiation such as short wave, Microwave etc as the energy is propagated as mechanical vibrations and gives a massaging effect to the deep tender part of the muscle. This is very effective in neuromuscular and muscular skeletal diseases including arthritis, sinusitis etc. 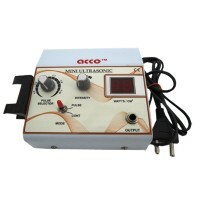 The treatment head gives continuous or pulses ultrasound waves obtained through a selective Knob upto 15 watts in continuous and 21 watts in pulsed modes. This appliance is latest development with fully Solid Microprocessor Controlled unit, with digital time & intensity display and is very lightweight compact and portable. 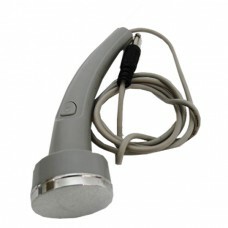 The sound head with a special transducer is designed to keep a very good skin contact for deep ultrasound therapy. The ultrasonic waves differ from other electromagnetic adiation such as short wave, Microwave etc as the energy is propagated as mechanical vibrations and gives a massaging effect to the deep tender part of the muscle. This is very effective in neuromuscular and muscular skeletal diseases including arthritis, sinusitis etc. 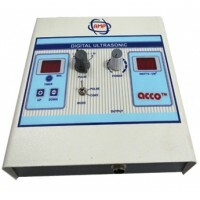 The treatment head gives continuous or pulses ultrasound waves obtained through a selective Knob upto 15 watts in continuous and 21 watts in pulsed modes.